Item #ST-INS-HAT Star Trek-Insurrection Logo Hat $20.00 ea. In Stock These black Star Trek Insurrection logo hats are officially licensed, come in black only with a silver embroided movie logo, hat is 100 % cotton, with black plastic sizing strap, only have a few available. 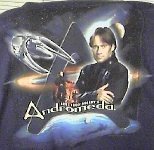 Item #AND-TS-1 Andromeda-Dillon Hunt T-Shirt 12.00 ea. In Stock This blue Dillon Hunt, Andromeda t-shirt is 100% pre-shrunk cotton,is one sided,has the Andromeda ship & logo with Dillon in full color, comes in Medium Only. Item #56774 Fleet Games Inc.-Stargate SG-1 Board Game $39.95 ea. In Stock This 2003 Stargate SG-1 board game is officially licensed, includes easy-to-learn rules with deep game play, 840 detailed plastic Stargate SG-1 Goa uld, Earth and Asgard starships, stargates and combat units, 5 six sided dice, phenomenial board of the universe and 50 Stargage SG-1 playing cards, game is still sealed and near mint, never been opened or played.